Tom Savini and I at Crypticon. 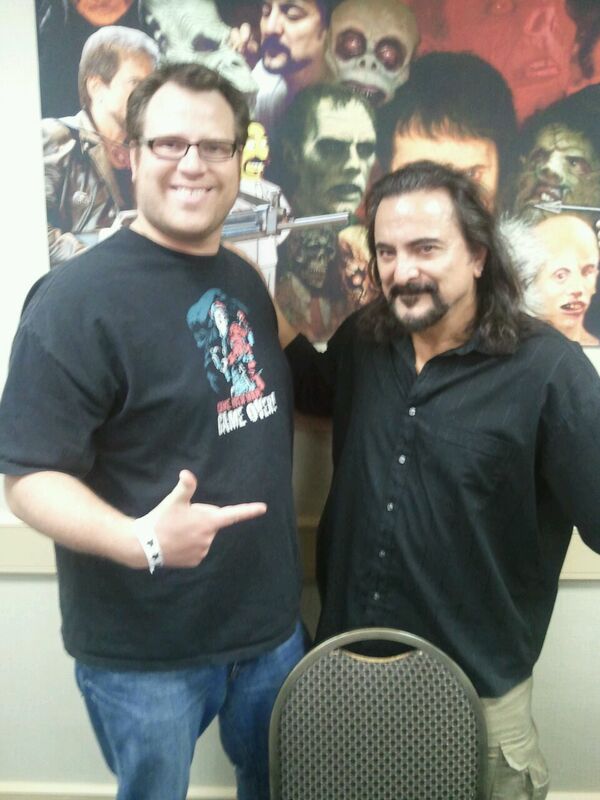 I finally got to meet Tom Savini at Crypticon this year. I immediately asked if he had brought “Fluffy”, which is the name he gave to the insatiable eating machine from the fourth segment of the film Creepshow. He laughed and politely told he he thought the Fluffy prop worked well because they were careful to avoid showing it too often. Fluffy remained mysterious. I was star-struck around the man who defined the look of gory horror special effects from the 70s on. I mostly babbled and nodded and tried not to sound ridiculous. I wanted to tell him to take that back, because I knew in my heart Fluffy was real and he lived in a crate under stairs and popped out to eat people. After I cancelled a trip to the local haunted house in the sixth grade, I decided to stay at home to watch Creepshow. I taped it off late night network TV. I was convinced I was finally old enough to handle scary movies. The “Father’s Day” and “Something to Tide You Over” segments disturbed me, especially when Cheers Ted Danson faced drowning in the tide while buried up to his neck in sand. Then, I got to “The Crate.” All you need to know about “The Crate” is that a small, furry thing with big teeth waits in a crate until the audience forgets he’s in there. Then he pops out, opens his mouth about a mile wide, and shreds any flesh he’s near. That night, I slept on a chair to keep myself breathing through what was probably another fall bronchitis attack. This chair was positioned in the corner of the room. If you picture it, you’ll soon realize that leaves a small space between the back of the chair and the corner of the room. You guessed it. Perfect Fluffy hiding place. I spent the night working up the courage to look behind me, sure with each peek thumb-sized teeth would crack through my skull while taking a bite out of my face. Later, while hanging out with a junior high friend, I brought Creepshow to a friend’s house. I was terrified, and he just fell asleep. When the movie was over, we switched to It and within five minutes he was horrified and I felt vindicated. Sorry, Pennywise. Fluffy got to me first. I’m spoken for. Fluffy, I know you’re still out there. I know you’re hiding under staircases, waiting in dark places. I know you’ll eat my face off someday, and I’ve learned to accept this. I’ll give you a high-five when you finally do pounce at me, but you’ll probably just eat my hand, too. Burned, Then Back to the Flame.